May have had this discussion somewhere before! I have a perfect NOS 12 plate oil cooler still in the box. Well, the box was opened, but other than that, its NOS for sure. So this makes a delema. I also have 2 excellent used 12 plate oil coolers. Now if I was to install the NOS unit, then I would have 3 used ones. If I use one of the used ones, I still have the NOS. So who would want to install the NOS cooler, only to make it like the old one? Does being new add to it's value-price? Once it's installed it just like the used ones. How many other NOS parts fall under this category? I can see trim parts value as NOS. But mechanical parts that are much more common and in good condition, beg to this question. Especially items like this oil cooler that are not prone to wear like bearings and other moving parts! Other parts, just to name a few come to mind like fan belt retainers and hubs for fan bearings and valve cover retainers! So there is the question. Are some NOS parts in reality no more valuable than good used ones???? Ponder Ponder Ponder..... or just forget about it and sit back and have a cold beer! You should definitely install the used one and send me the NOS one. Used ones always scare me because I never trust them to be totally clean. Keep the NOS one! I had over 50 of them and always nice to install a brand new one on a new engine! I have 3 - 8 plates I have been cleaning for a weeks and still getting crud out of them! I just bought a ultrasonic cleaner from HF and trying it out! new is always better than used for a new engine! Every Corvair owner should keep some "Shelf Candy" for personal satisfaction. If you don't use it you will still have it. Oil coolers get dirty right away.Clean a used one. My two cents. 41 years in collision and restoration. 1966 Corsa A/C coupe- Mechanically repaired and on the road. The NOS value thing is up to the individual. HOWEVER - I agree with motohead that used oil coolers are always full of crude. I have gotten them cleaned out, but what a long process involving $$$ for different solvents. Dave - if you aren't sure you can clean out the used ones, then use the NOS as motohead suggested. NOS oil coolers are the one part I never sold, always scared there is that one stuck chunk of crud in a used filter that will destroy a new engine! N O S 3 plate oil coolers? Would a radiator shop be able to clean the oil cooler? > Hey DaveM., I know you had some N O S oil coolers. > N O S 3 plate oil coolers? I been trying to sell those 3 plates! sold one for $12.59 to a guy for a concourse 63, no one wants the others! Been soaking in gas for a week or 2 and still crud coming out! Too bad we are past the days when you could buy just about any solvent over tha counter at the paint or hardware store. You know, like Toluene and MEK to name just a couple. Bet they'd do the trick. Anyone know if you used to could buy Trichlorethane or whatever the military used. I'm thinking you could have. Used to be able to easily get carbon tetnicloride pretty easy. You win some, you lose some. Better and worse living at the same time through chemistry, eh. Edited 1 time(s). Last edit at 09/11/2018 07:11PM by Vairismo. MEK and Xylene are on the shelf at Lowe’s here. The Montreal Protocol targeted 1,1,1-trichloroethane as one of those compounds responsible for ozone depletion and banned its use beginning in 1996. Since then, its manufacture and use have been phased out throughout most of the world. I found carb dip cleaner works wonders. I used toluene, acetone etc. and when I put in the carb dip liquid inside the oil cooler and let sit, I got the crud out that the others left behind. After the carb dip, rinsed with a pressurised hose water to flush and then followed up with acetone to make sure any traces of carb dip was gone. The carb dip I used was old formula from about 15 years ago, not sure about the modern stuff. Getting back to the NOS cooler I had the same dilemma a while back! I was building an engine, a race engine at that! I put on the cleaned cooler and it had a leak from a seam, I cleaned and put another on and it leaked. I said screw this so I put the NOS one on! Guess what? There was a little pressure when you bolted the tail end down and the NOS cooler cracked and leaked also. I corrected the issue after that and put a 4th cleaned folded fin cooler on and all was well. 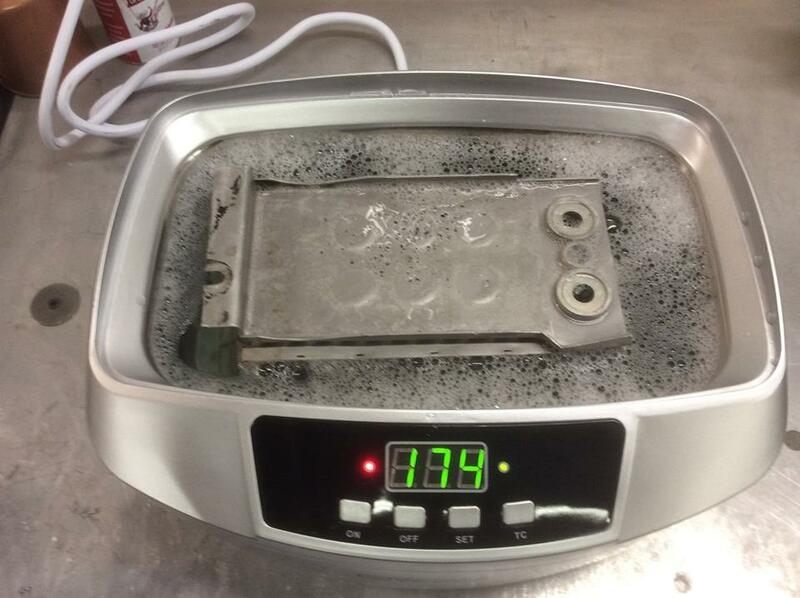 If you are serious about cleaning a used oil cooler then maybe send it to where people have them cleaned and tested becuase it could be a matter of life or death. "...We are the world’s largest FAA Repair Station for aircraft oil coolers. We also service a large number of automotive oil coolers, radiators, and heat exchangers. We put the automotive units through the same exacting cleaning and repair process that the aircraft units go through, but at a fraction of the aircraft cost. The results speak for themselves, with very high quality results. ....and so goes the Corvair parts horder!!! REALLY??? If you have a NOS part, and are so concerned about used parts....JUST INSTALL THE NOS PART, AND DRIVE THE CAR!!!! !